These programs are for athletes ages 3 & up. At practice, tumblers work on tumbling and/or trampoline skills and also use stretching, drills, and exercises. All Team classes include conditioning to improve strength and flexibility. The team competes several times per year in Illinois and the athletes can also qualify for the National Championship. The location of Nationals varies from year to year across the US. These athletes work on more advanced skills and passes as they improve. We encourage any athlete to take part in team classes. Team students are required to take part in classes year round. Team teaches your child values that they can take with them in all aspects of life. All Team classes meet 2 times per week. At these levels athletes are working on rolls (forwards & backwards), straddle rolls, cartwheels, round offs, back walkovers & limbers, and front walkovers & limbers. After students have all of these skills mastered they will begin working on a flip flop. 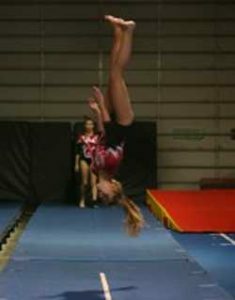 Team II practices 2 ½ hours of Tumbling per week & 2 ½ hours of Trampoline & Double Mini per week. At these levels athletes are able to do a flip flop on their own. They work on adding more flip flops to a single round off flip flop. After students have mastered flip flops they will begin working on tucks and bounders. Team I practices 3 hours of Tumbling per week & 3 hours of Trampoline & Double Mini per week. At these levels athletes are able to do powerful flip flops, bounders, and baranis. They will begin working on mastering twisting skills and reversals.